(Type A/Type B/Type C) This dial controls temperature. Turn it clockwise for hot and anticlockwise for cold. 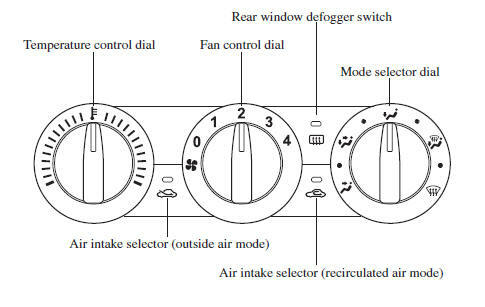 (Type D) This dial controls the air temperature when using the air conditioner. Turn it clockwise for cold. Turn the mode selector dial to select airfl ow mode (page 5-4 ).
) between each mode. Set the dial to an intermediate position if you want to split the airfl ow between the two modes. Outside air is allowed to enter the cabin. Use this mode for ventilation or windscreen defrosting. Do not use the recirculated air mode in cold or rainy weather: Using the recirculated air mode in cold or rainy weather is dangerous as it will cause the windows to fog up. Your vision will be hampered, which could lead to a serious accident. This lever controls the source of air entering the vehicle. It is recommended that under normal conditions the switch be kept in the outside air position. (Type C) Outside air is taken into the vehicle. Use this position for normal ventilation and heating. (Type D) Outside air is taken into the vehicle. Use this position for normal ventilation. weather is dangerous as it will cause the windows to fog up. Your vision will be hampered, which could lead to a serious accident. Set the air intake selector to the outside air mode. Set the temperature control dial to the hot position. Set the fan control dial to the desired speed. (Type A/Type C) If dehumidifi ed heating is desired, turn on the air conditioner. position and adjust the temperature control dial to maintain maximum comfort. The air to the fl oor is warmer than air to the face (except when the temperature control dial is set at the extreme hot or cold position). air mode is automatically selected. The air intake selector cannot be changed to the recirculated air mode. Turn on the air conditioner by pressing the A/C switch. 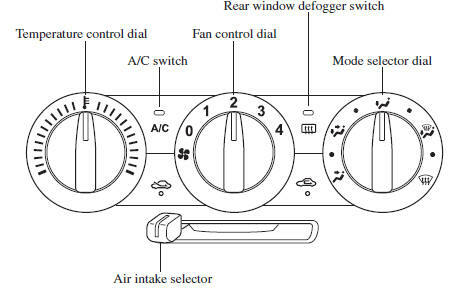 After cooling begins, adjust the fan control dial and temperature control dial as needed to maintain maximum comfort. If the air conditioner is used while driving up long hills or in heavy traffi c, monitor the engine coolant temperature warning light to see if it is illuminated or fl ashing (page 4-37 ). The air conditioner may cause engine overheating. If the warning light is illuminated or fl ashing, turn the air conditioning off (page 7-26 ). 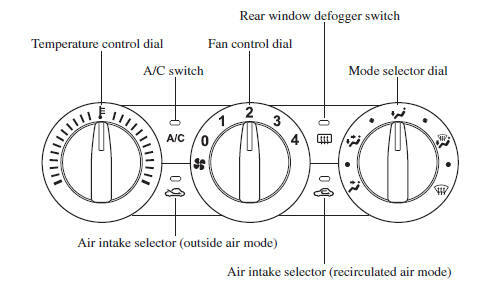 When maximum cooling is desired, set the temperature control dial to the extreme cold position and set the air intake selector to the recirculated air mode, then set the fan control dial to position 4. 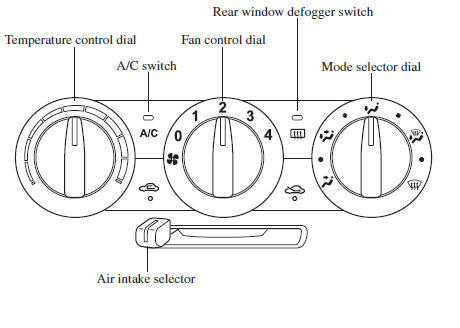 (Type A/Type C) If warmer air is desired at fl oor level, set the mode selector dial to the position and adjust the temperature control dial to maintain maximum comfort. (Type A/Type B) Set the air intake selector to the outside air mode. Set the temperature control dial to the desired position. (Type D) Press the A/C switch to turn on the air conditioner. position with the temperature control set to the cold position is dangerous as it will cause the outside of the windscreen to fog up. Your vision will be hampered, which could lead to a serious accident. Set the temperature control to the hot or warm position when using the position. position with the temperature control set to cold after the windscreen has defogged is dangerous as the outside of the windscreen will fog up. Your vision will be hampered, which could lead to a serious accident. position and turn on the windscreen wipers to clear the window. (Type A/Type C) For maximum defrosting, turn on the air conditioner, set the temperature control dial to the extreme hot position, and the fan control dial to position 4. Operate the air conditioner in cool or cold weather to help defog the windscreen and side windows. Set the mode selector dial to the desired position. (Type A) Set the air intake selector to the outside air mode. (Type C/Type D) Set the air intake selector to the position. (Type A/Type C) One of the functions of the air conditioner is dehumidifying the air and, to use this function, the temperature does not have to be set to cold.